On a freezing cold and wet night in February, heavily pregnant moggy Asha was brought into the care of Cats Protection’s Lichfield & Tamworth Branch. She had been found by a member of the public near a motorway and after being checked over by the vet it was discovered that she was due to give birth very soon. Poor Asha grew bigger day by day until on 26 February she went into labour. Exhausted from her time as a stray and the fact her kittens were overdue, Asha found the birth incredibly difficult. 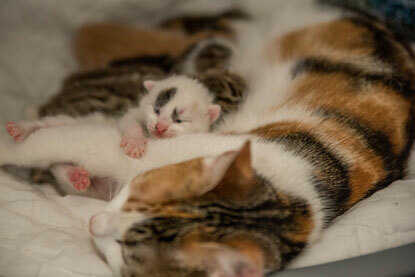 The labour lasted six hours but eventually Asha had six beautiful kittens. Becoming a mother hasn’t been easy for poor Asha, but she is quickly learning that her litter will squeal loudly if she doesn’t feed them often enough. Although her kittens are incredibly cute, Asha’s traumatic ordeal could have easily been prevented if she had been neutered. To learn more about the importance of neutering, visit the Cats Protection website, where you can also find out how Cats Protection can offer financial assistance with the operation. I'm glad Asha and her little kittens are doing so well. Miss having her around when we found her. She was so beautiful and a very well behaved cat for the very short time I could look after her. 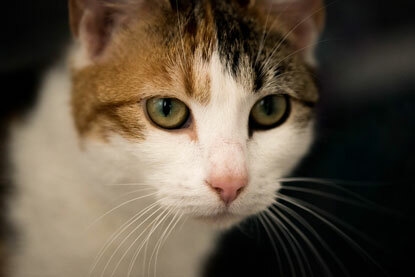 Hope she and her kittens find a loving family and home. I couldn't keep her as I have two cats and a dog already.